This is a piece that is partly about the Swedish poets Harry Martinson and Karin Boye. It's also partly about Trientalis europaea. I suppose I ought to call it "On Chickweed Wintergreen", but, more pickiness, I don't like titles that begin with "On". Chickweed Wintergreen is one of those translation-titles, like Scott Moncrieff's Remembrance of Things Past, that proclaims a certain robust independence from its source-text. 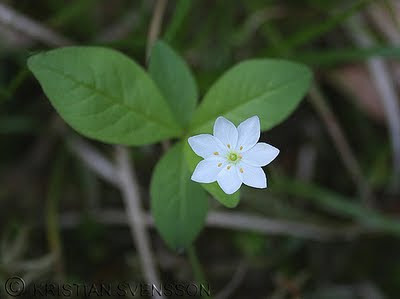 Yes, there is a poem in the book that is titled "Chickweed Wintergreen", and yes, this is a translation of a poem by Martinson that is titled "Duvkullorna", which is one of the Swedish names for the species of plant (Trientalis europaea) that in English is named "Chickweed Wintergreen". But flower-names, espcially within poetry, are about a lot more than denoting a species. Rarely are they merely a word, such as "tulip". The metaphors within them, usually, are far from buried. Most names are, or seem to be, wholly or somewhat descriptive. "Chickweed Wintergreen" being a case in point: great name for a book: zany, fresh and popping with images. But this is an effect that owes little to Harry Martinson. The title strikes the imaginative reader precisely because, in Britain, the plant is not very well-known. The sad truth is, Trientalis europaea has always been too scarce to make much impression on UK culture. Quite why that is, isn't altogether clear. There seems to be plenty of the kind of thing that it likes (moss, moor, open pinewoods), yet it's always rare in England (the north, E. Suffolk), and only locally common even in Scotland. Which explains the background to the English name "Chickweed Wintergreen", not exactly an academic name but clearly a plant-hunter's name rather than a traditional folk name (the oldest OED reference is 1760). Imagine the scene: intrepid botanist wandering through an ancient Scottish pinewood, around midsummer; a place distinguished by members of the wintergreen family (Pyrola, generally rather local in Britain); botanist suddenly notices some leaves that seem a bit similar (i.e. oval-ish) but, behold, there's a flower on top that looks totally unlike Pyrola, but does look a bit like a chickweed (Stellaria). That, or something like it, must be how the name arose. I mean, taking into consideration that not only is the plant unrelated to either chickweeds or wintergreens, but it isn't eaten by chickens and it isn't green in winter! Well, this is Martinson's little poem, which was published in the collection Passad (Trade Wind) in 1945.
med karg nätthet i mossan. är inte mindre än ekens. The Woodland Stars never luxuriate. with sparse elegance among the mosses. is not less than the oak's. Photo copyright Kristian Svensson, but I don't know how to contact him for permission! It's one of those plants that doesn't exactly shout to us (small white flowers usually don't), but once it's noticed it's quietly striking. Along with Twinflower (Linnaea borealis), it was a favourite of Linnaeus. In Flora Lapponica (1737) he wrote: "I don't know any other flower whose grace so fascinates the eye; the spectator becomes almost bewitched! Maybe this is due to symmetry, the mother of all beauty." Martinson doesn't say anything about these features: he relies on the reader to do most of the evoking. All he tells us by way of description is that the plant is "spenslig" (slight, or slender), and this stands in for all the rest. Of course there are a great many plants that could reasonably be called slight, at least in comparison to oak trees, but perhaps there is a particular appropriateness in applying it to this one, where it glances both at the parsimonious production of flowers and at the plant's tendency to appear as isolated individuals rather than profuse stands. In fact, these plants are not really isolated individuals. They are connected, beneath the woodland surface, by long lateral growths that throw up superterranean extrusions at rather lengthy intervals. 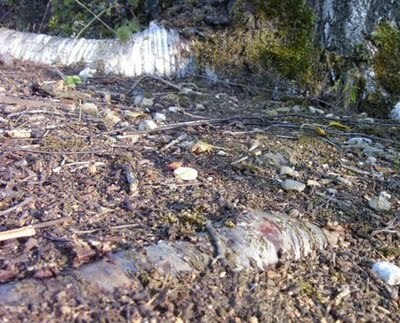 That is the main way that Trientalis europaea spreads (or should I specify, the DNA of T. europaea): it puts most of its energy into securing its presence in a good habitat, and not much of its energy into the chancy business of colonizing new sites; few flowers, and even fewer seeds. Hence it never turns up in new woodland, but is a reliable indicator of old woodland. "A good competitor, but a poor colonist," comments the BRC on-line atlas. he is not only right about the specific case of Trientalis europaea, though that's still worth emphasizing. Modest and isolated as the plant appears in a European context, it is certainly a successful species, with a circumpolar distribution through the boreal regions of the Old World, and also in Western North America (in the east, it is replaced by the related T. borealis). But the general case applies too. Perhaps he had heard of the Dane Wilhelm Johannsen's genotype-phenotype distinction (1911), which has proved such a fertile ground for later writers. Perhaps his conclusion also amounts to a recognition that determination is the preserve of the genotype, and the success of a genotype has nothing to do with whether its phenotype happens to be an impressively mighty oak or some unattended unicellular organism, a reflection that will be commonplace to readers of e.g. Richard Dawkins. Nevertheless, the poem does not quite come to rest on this scientific meditation. After all, taken at that level of generality the human connotations of "spenslig" / "slight" lose their validity altogether. But the poem clings on to them: great determination there must be, but the slightness is not dispensed with. It becomes a defining quality of the particular determination with which the poem is concerned: it intends to praise slightness. It's time to think about the context of the poem. Like many of Martinson's nature poems, it appears at first glance to contain no human context whatever: there are no figures in the landscape, it is alienated from human concerns. And that is intentionally a challenge; an assertion that nature cannot be known if framed or tamed by the quotidian and human. This is a game that Martinson played from the off. Coming to poetry after a youth on the oceans, he repeatedly brought his public up against the realization that he was no stay-at-home, that he had un-domestic experience that his readers didn't share with him: for example in the famous poem that begins "Have you seen a steam collier" (1929) - he means, after a storm at sea - and draws all its energy from the unmistakable implication: No you haven't, but you know that I have. "Home Village" (1931) had framed the "silent lie" of tranquil village life through the eyes of one returning from "the brothel alleys of Barcelona". Yet a nature poem such as this one does, lightly, intrude an awareness of a domestic context. Though the plant in question is not exactly commonplace, we've seen that a tradition already existed, among reasonably sensitive observers, of appreciating its finer features ("I don't know any other flower whose grace so fascinates the eye..."). Domestic bliss, Swedish style, tends to involve not just the home but its extension into the trees and the borders of that everlasting wood, where one is always roaming about, if only to find a good spot to fling out the washing-up water. There's a further clue to this context in the two Swedish names for Trientalis europaea that appear in the poem. I've translated them literally; unlike the English name "Chickweed Wintergreen", both were evidently folk-names rooted in long tradition. But the one that Martinson uses in the title (Duvkulla - "Doveflower") was evidently a local name; it is certainly not much used now, and the only Google reference that isn't talking about Martinson's poem comes from a 1923 article in the provincial newspaper Dalpilen. It was the other name (Skogsstjärna - "Woodland Star") that was, then and now, in general use; and doubtless it turns up in the poem's first line in order to ensure that the reader knows exactly what plant Martinson is talking about. The local name in the title amounts to a confession: it is the poet's own name for the plant because it's the name he grew up with, in a countrified provincial locality, long before he set off to sail the world. The poem then, implies the limited rambles of a child close to home: domestic surroundings. The defiant praise of slightness, in this context, amounts to a sentimental, perhaps desperately sentimental, defence of the limited horizons and quotidian activity of an unassuming home. Martinson had no particular reason to be sentimental about his own childhood; at the same time he was a popular poet, both working with popular sentiment and inevitably yielding to it, at least in respect of its thought-forms. Taking refuge in small things was a sentiment that lay deep in popular culture. I don't want to reduce Martinson's poem to its popular substratum, but at the same time it's important to understand the substratum. I want to approach it by way of the hugely popular pan-Nordic standard "De nære ting" / "Små nära ting". The composers of the melody, Kurt Foss and Reidar Bøe, recorded the song in 1951, both in Norwegian (June) and Swedish (September). There were numerous subsequent recordings and, as is the way with standards in Sweden, a host of drinking-song parodies. I'm taking most of my information from Enn Kokk's interesting blog. The original Norwegian lyrics were composed by Arne Paasche Aasen (1901-1978), a strongly left-wing politician, activist, journalist and poet. As a populist poet his work graded into song lyrics: rousing labour movement songs such as "Vi bygger landet" (based on an earlier Russian anthem), but also sentimental songs like "De nære ting". Norwegian and Swedish are so closely related to each other that translating from one into the other is a doddle, and Ture Nerman's Swedish version is sometimes almost word for word. The main difference is the inclusion of the word "små" (small); the Swedish title means, literally, "small near things", but you can't put that into idiomatic English without becoming wordy: "the little things close by", or something of that sort. the things by your side. What is it you're seeking? used to care about once. du haft i din hand. right here in your hands. Ture Nerman (1886-1969), like Arne Paasche Aasen, had begun as a communist and was later a social democrat. But the song-lyric is solidly conservative in intention, intrinsically dubious about ambition and idealism. It may not be relevant to point it out, but they were no longer young men. "Små nära ting" is a classic consolation-lyric, like that other song from 1951 "Cold Cold Heart" (Hank Williams, Tony Bennett), and such countless predecessors as the Irish standard "I'll Take You Home Again Kathleen" (in fact composed by an American, Thomas Paine Westendorf, in 1876). "Små nära ting" is less obviously aligned to the heteronormal male subject / female object format than either of those songs; in fact the most-remembered recording is probably Monica Neilsen's, if it isn't Anna-Lena Löfgren's. from the person you are. Let go, brother, let go. When Martinson built his poem towards that assertion about "the determination of the slight" he was, I believe, recalling another short poem published ten years earlier, by Karin Boye. Recalling it unconsciously, perhaps: he does not use the same words, but the shape of the clinching line surely betrays a kinship. Då blev min hand så aktsam och komma inte att darra. Then it was my steps became cautious and would not stumble. Then it was my hand became careful and would not shake. The better day, that is a day of thirst. But (as is always the case) the defiance conceals an awareness of the contrary pull, i.e. towards domestic peace. What takes her by surprise in the poem about the glass bowl is, perhaps, exactly a feeling of momentarily being at peace with her surroundings. And, of course, they are domestic surroundings: passing between a main house and an outhouse, and taking care not to trip on the ubiquitous birch roots. And this strength is what is communicated to the carrier who doesn't drop the bowl; her own tensed poise, being patently required of her, is accordingly manifested, and it reveals her capability to herself; not only her capability either, but the deep peace of having a nurturing role, and fitting it; the nurturer is dependent on her charge. A deep peace, for as long as it lasts. Because, for both poets these would-be idealistic poems constituted swimming against the tide. There is a cry of desperation in their restfulness; in both of them, though Martinson's buttoned-up prickliness is so different from Boye's vulnerable transparency. Both were wanderers who returned to the little things; Boye, to the fateful role of carer that is imagined as a fulfilling pattern in her poem. But their bliss was most tranquilly revealed in poems that ignored the complications of people. In April 1941 Karin Boye, anguished by personal distresses as well as the war, took a one-way walk into the wintry countryside; she was carrying only a bottle of sleeping-pills. Harry Martinson, product of a broken working-class home, his health ruined at sea in his youth, allowed the bitter freshness of his early poems to ferment into settled gloom. The last straw, perhaps, was winning the Nobel Prize in 1974; or more particularly, the barrage of adverse comment that it induced (mainly within Sweden itself). The prize was shared with Eyvind Johnson, another working-class writer; both were now members of the Nobel committee, so the award was certainly a bit naïve. In 1978 Martinson attempted to commit ritual suicide by disembowelment (seppuku) with a pair of scissors. He was horribly injured and died a few days later.